Development of the EB 110 started in 1988 and the design work was contracted to famed Italian automotive designer Marcello Gandini. Initial prototypes based on Gandini's design began testing in 1989 but the President of the company was not impressed by Gandini's angular and radical design language incorporating a shovel nose and flared rear wheel arches. When Gandini refused to redesign the car, Giampaolo Benedini was tasked to redesign the car. Thus the design language of the car was softened, the front of the car was reworked and a network of cooling ducts on the bonnet was replaced with ducts in the front bumper and near the two large fixed headlamps which replaced the pop-up head lamps while the basic elements of Gandini's design such as the scissor forest and the large windshield and side windows were retained. Most of the engineering work of the EB 110 was carried out under Paolo Stanzani as the technical director who had come from Lamborghini to work for the company. Following his sudden departure from the company, Nicola Materazzi, who had a vast experience of working with Lancia and Ferrari, was assigned as the new technical director in order to complete the development. The car had many innovative technologies which were scarcely used by the automotive industry at the time of its introduction such as a carbon fibre monocoque chassis, active aerodynamics and an all-wheel-drive system for better handling. The design elements of the car paid homage to the distinctive Bugatti automobiles of the past. The name EB 110 is an abbreviation for the company's founder, Ettore Bugatti and his 110 birthday. The Bugatti EB 110 GT was unveiled on 15 September 1991, at both Versailles and in front of the Grande Arche de la Défense, near Paris, exactly 110 years after Ettore Bugatti's birth. A lighter and more powerful variant with 450 kW (612 PS; 603 hp) called the EB 110 Super Sport was introduced at the 1992 Geneva Motor Show just six months after the introduction of the EB 110 GT. The Super Sport variant was lighter then the GT by 150 kg (330 lb) which was achieved by the use of carbon-fibre body panels on the exterior and in the interior. The Super Sport could attain a top speed of 355 km/h (221 mph) and could accelerate from 0–100 km/h (0–62 mph) in 3.2 seconds. Early in 1994, Formula One driver Michael Schumacher purchased a yellow EB 110 Super Sport, giving the company a great deal of publicity. Schumacher retained the car until 2003. Hard times hit the company in 1995 and as a result of chairman Artioli's over-ambitious purchase of Lotus Cars in addition to the company's quest to develop the EB112 four door saloon along with the negative exploitation of the company's suppliers, the company was bankrupt. Dauer Racing GmbH of Nuremberg, Germany, bought the semi-finished EB 110 cars in the assembly plant plus the parts inventory through the bankruptcy trustee. The remaining chassis were later developed by B Engineering into their Edonis sports car which uses the monocoque chassis of the EB 110 combined with a modified version of its engine. The car has a 60-valve, quad-turbocharged V12 engine fed through 12 individual throttle bodies, powering all four wheels through a six-speed manual transmission. The 3,500 cc (3.5 L) engine has a bore x stroke of 81 mm × 56.6 mm (3.19 in × 2.23 in). The EB110 GT had a power output of 412 kW (560 PS; 553 hp) at 8,000 rpm and 611 N⋅m (451 lb⋅ft) of torque at 3,750 rpm. The performance oriented Super Sport version had the engine tuned to a maximum power output of 450 kW (612 PS; 603 hp) at 8,250 rpm and 650 N⋅m (480 lb⋅ft) of torque at 4,200 rpm. The car uses a double wishbone suspension, with the chassis built by Aérospatiale, an aircraft company, and made from carbon fibre. Equipped with Gandini's trademark scissor doors, it has a glass engine cover that provides a view of the V12 engine. The GT is equipped with a speed-sensitive electronic rear wing and active air flaps near the rear window that can be raised at the flick of a switch manually, while the Super Sport has a fixed rear wing. Official performance numbers for the Bugatti EB 110 GT are 0–60 mph in 3.4 seconds, 0–100 km/h in 3.46 seconds and a top speed of 342 km/h (212.5 mph). French automotive magazine Sport auto recorded a 0–100 km/h (62 mph) acceleration in 3.5 seconds, 0–1000 m time of 21.2 seconds and a top speed of 338 km/h (210 mph). Official performance numbers for the Bugatti EB 110 SS are 0–60 mph in 3.14 seconds, 0–100 km/h in 3.26 seconds and a top speed of 355 km/h (220.6 mph). The testers suspected that the acceleration numbers could be lowered considerably by using the clutch more recklessly than they did. French magazine Sport auto measured 0–100 km/h (62 mph) in 3.3 seconds, 0–400 m in 11.0 seconds, 0–1000 m in 19.8 seconds and a top speed of 351 km/h (218 mph) for the EB 110 Super Sport. Dauer Sportwagen in Nuremberg, Germany, bought the remaining stock of EB 110 parts from the Bugatti factory after the company went bankrupt in 1995. A complete spare parts catalogue, with exploded diagrams and part numbers was made by the company. Three Super Sport models and a GT model were finished between 1999 and 2000 with the Bugatti logo and minor modifications. The remaining incomplete chassis were used between 2001 and 2002 to manufacture five significantly improved cars called the Dauer EB110 Super Sport Light Weight. Power output was increased to 481 kW (654 PS; 645 hp), turbo lag was decreased and weight was reduced by 230 kg (507 lb) with the use of a body made from carbon fibre. Top speed of the car was estimated at 370 km/h (230 mph), acceleration from a standstill to 97 km/h takes 3.3 seconds and the car covers the standing kilometre in 19 seconds. A power output increase to 526 kW (715 PS; 705 hp) with sports exhaust and modified ECU was available as factory option. The company Dauer Sportwagen went bankrupt in 2008. All original Bugatti parts especially the high performance parts of the EB 110 Super Sport and the equipment were bought in 2011 by the company Toscana-Motors GmbH located in Kaiserslautern, Germany. The B Engineering Edonis is based on the Bugatti EB 110 Super Sport but has been extensively re-engineered, retaining little more than the carbon-fibre chassis from the original Bugatti sports car. Introduced in 2000, both the exterior and interior of the car have been completely redesigned. The 3.5-litre Bugatti engine has had its displacement increased from 3,500 cc to 3,760 cc. The original four small IHI turbochargers have been replaced by two larger units from the same manufacturer. Engine power has been increased from 450 kW (603 hp) and 650 N⋅m (479 lb⋅ft) of torque to 507 kW (689 PS; 680 hp) at 8,000 rpm and 735 N⋅m (542 lb⋅ft) of torque. In addition, the four-wheel-drive triple-differential drivetrain from the donor car has been replaced with a much simpler and lighter rear-wheel-drive transaxle, thus saving approximately 70 kg (154 lb) from the total weight. The car weighing 1,500 kg (3,307 lb) has a power-to-weight ratio of 480 hp/ton. In addition, the engine's specific power output is an unprecedented 181 hp/litre. The brand claims a maximum speed of 365 km/h (227 mph) while acceleration from 0 to 100 km/h (62 mph) being achieved in 3.9 seconds. B Engineering planned to produce just 21 examples of the Edonis out of the parts retained by the company of the original EB 110 when Bugatti S.p.A went bankrupt. Apart from manufacturing the Edonis, B Engineering also provides spare parts and service for the original EB 110. The Brabus EB 110 is a modified version of the EB 110 Super Sports by German automotive tuning company Brabus. The car has not received any exterior modifications by the company with most of the modifications done to the interior and engine. The car has a bi colour blue and black leather interior and a custom made quad pipe exhaust system. Engine modifications of the car along with its performance statistics remain unknown. This is the only EB 110 modified by the company. The car's existence was known after it was put on sale in 2013. The EB 110 LM participated in the 24 Hours of Le Mans in 1994. The car qualified a very competitive 17th overall and 5th in the GT1 class but did not finish the race. The car is now on display at the Lohéac Automobile Museum. A second car commissioned by wealthy pharmaceutical entrepreneur Martino Finotto also participated in the 1996 24 Hours of Daytona, but suffered a gearbox problem and did not finish. ^ "Bugatti EB 110 Technische Daten". Retrieved 3 February 2019. ^ Barker, John; Gregory, Gus (2005-03-31). "Bugatti EB110 meets Edonis: The Offspring". Evo. Retrieved 2019-02-02. ^ a b Collins, Andrew (2019-01-22). "These Bugatti EB 110 Explainers Will Give You a New Appreciation for That Toy Blue Car You Had". Jalopnik. Retrieved 2019-02-02. ^ "#39020 (Michael Schumacher's EB 110)". 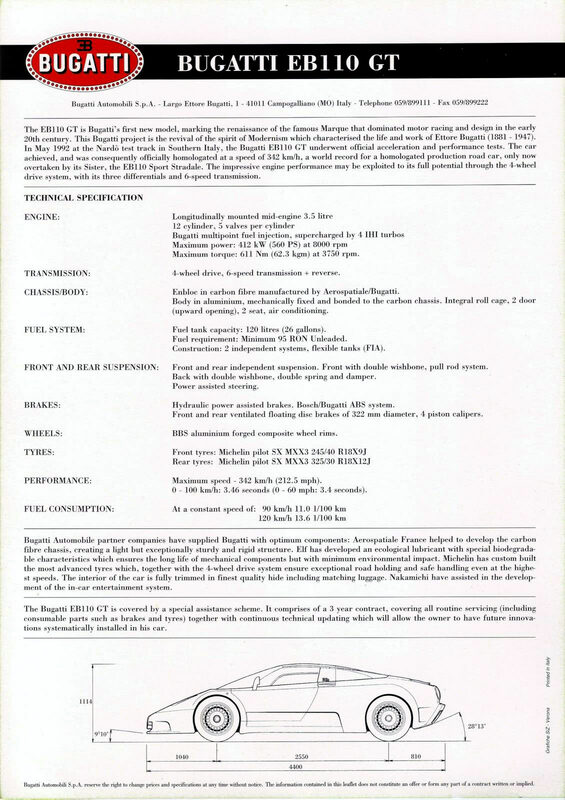 Bugatti EB 110 Registry. Retrieved 2012-01-31. ^ Davis, Tony (2004). Lemon! 60 Heroic failures of motoring. Sydney: Random House Australia. p. 150. ISBN 1-86325-494-3. 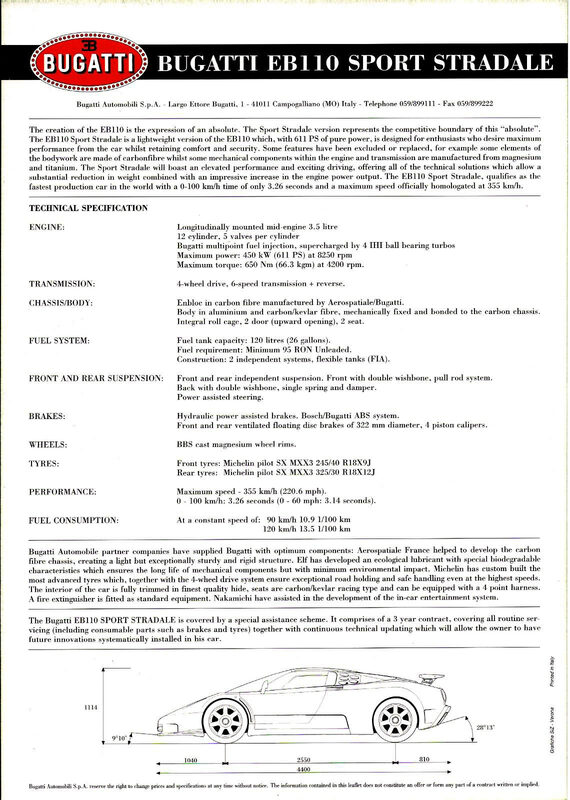 ^ "Bugatti EB110 SS specifications". carfolio.com. Retrieved 26 February 2018. ^ a b c d e f g "Road Test: Bugatti EB". AutoCar. 16 March 1994. Archived from the original on 2007-07-05. Retrieved 2017-12-28. ^ "2000 Bugatti EB 110 Super Sport - Dauer". Retrieved 2019-02-03. ^ Glucker, Jeff (2017-08-11). "A rare Bugatti EB110 SS Dauer is up for grabs for $1.16M". Motor Authority. Retrieved 2019-02-01. ^ "The Bugatti EB 110 Registry - The Dauer EB 110 Supersport". Yo.spc.free.fr. Retrieved 2010-11-28. ^ Kuah, Ian (May 2002). "A second coming". Sports Car International. ^ "A-Z Supercars: B. Engineering Edonis". Evo. 2013-05-13. Retrieved 2019-02-02. ^ Kautonen, Antti (2013-05-02). "An already rare Bugatti supercar made even rarer". Road & Track. Retrieved 2019-02-01. Wikimedia Commons has media related to Bugatti EB 110.